should consult your rabbi first. Mayor David Keating (right) during Community Day. the United States is what a true ally should be,"
'We have not heard the last of Lebanon . Jewish Federation of South Broward. general backed a plan to amass all U.S.
brilliant calculation,'' the writer joked. is less tolerant of KKK activity. aplause from the 2,000 persons in attendance. Semitism of the Soviet Union. Jews had recently received harsh responses. the Jews in the Soviet Union, they will be lost." many people, including Jews, scream and yell." Arafat and what he "represents." would not have had to happen." had been caught up in the war. death of an Israeli soldier. Spring Semester 6:30 9:30 P.M.
Wed. "Ethics of the Fathers"
the center, 2838 Hollywood Blvd. . Call the JCC at 921-6511. "We are going to fill the gap. ple from the New York City area. Israel during the war in I^banon. message and lit candles to light the way to freedom. 1979, Jews allowed to leave the Soviet Union totaled 51,320. Tel Aviv and Hod Hasharon. JFSB, 2719 Hollywood Blvd., Hollywood, Fla.
33020, with your name and address.
" Senate resolution on that subject. MlI JiA. Saaan An. WMS. NEA. ajfa and FP*. is exempt from public scrutiny. existence by being morally superior. tin- Sovereign State of Israel. record straight about what really happened. at why the reports were the way they were. strong anti-Israel bias did, nevertheless, occur. major "news," and the media reported it. and for Israel's own security. were not subject to many restrictions by the PLO. dangerous areas? Or Israel for killiing them? the PLO which Israel didn't already know? information until it had been verified. by the thinking prevailing in their group. is very simple, yet very difficult. YOUNG MEET ELDERLY In their Chanukah visit to the Golfcrest Nursing Home in Hollywood. Brownies Alavon Karp. Margaret Cohsa. Fsryl Orlinsky. Emily Sobd and Joy Clspper (left to right). 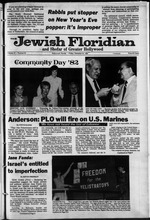 to the 1983 UJA-Federation i early seating. small to hold their own breakfast. fast on Sunday, Jan. 23, 1983.
man Eli Stiftel for details. Buffet on Sunday. Jan. 30, 1983. Avsiablt lo rersoiu 65 yean oT Aft and older. CALL FOK INfOKMATION OR APPOINTMENT. Jews in Israel and worldwide. sionals as his first official post. a 9-month old son. Daniel. The show, set for Sunday. Jan.
ly from New York's Town Hall. serious need for nursing home facilities. it something" is Mel Baer's explanation. Hebrew University and Nova University, among others. tions to the Baer Philanthropic Fund. As a result, the Baer fund will continue to grow and prosper. at 1801 S. Ocean Dr.
$8.95. Ages 5 to 8.
and Shepard, 105 Madison Ave.
New York, N.Y. 10016. 1982. $10.50. Ages 7 to 10. Call Me Rath. Marilyn Sachs. York, N.Y. 10017. 1982. 134pp. King of the Seventh Grade. first three books I am reviewing. and his early days in New York. were free to live as they wanted. sense, good sense and nostalgia. when she was only 8. Sunday aa a campaign tool by conducting the mammoth phonathon later in the year: Sunday, March 13.
date (it had been Jan. 23,1983) are still needed. Contact Melissa Martin (921-8810) at the Federation. who cares about the freedom. About Judaism. depends on him. And others like him. But without your support, he's fighting in vain. The war may be over, but the battle has just begun. support of Jews around the world. Federation of South Broward, today. THEY MADE IT HAPPEN Community Day organizers (from left> Sandi Gelfand. "Our helicopters would not helicopt." plex," the investigative reporter said. around the world in action. "Say Shalom to bright stars of Yiddish Theatre." Katz and Dina and Sumner Kaye. 1983 Campaign chairman; Sumner Kaye, executive director; Irving Fox, controller; Ben Salter, pre8j. Grade (for ages 11 and up). as executive director of the U.S.
mony at the White House. policies that his company sells. So his hands are tied. doesn't work lor one company. Ben Salter and Hal Rudin. The camp you always wanted to go to. Center. 9105 NW 57 St.
4525 Sheridan St.. Hollywood. Fla.
Carl a C, World Renaissance & Daphne. Sail to Caracas. St Maarten Guadeloupe Barbados St Lucia. and visit up to 12 pens at a special low price. Ask us about our special tall otters Good space is still available . leaving a legacy to Hadassah today! This holiday season, create some delicious magic from Publix. House of Raeford. (With Dressing. Where shooomq is a pleasure. Price* Effactiva in Dada. Broward, Palm Beach. Martin, St. Lucia and Indian Rrvar Countiaa ONLY! year, at Beth Torah Congregation. of 1984, and prices begin at $212,000. Jack and Rose Orloff, Joyce and Ted Newman. Rochelle Koenig, Leonard Schiff and guest. even proclaimed by Hollywood Mayor David Keating. dith Nassi, Ronit Andijar and Daren Grosman. lateral with the Soviet Union. clear war in our lifetime." And commanded us to kindle the Sabbath lights. Young Israel of Hollywood 3291 Stirling Road; 986-7877. Temple Beth El 1361 S. 14th Ave., Hollywood; 920-8226. Road, Pembroke Pines: 431-3638. Rabbi Bennett Graenspon. ning, 10:30 o'clock. Religious school: Pre-school-12. I work and at home. Ian. 6, 1983, at 2 p.m.
day 9 a.m. to 9 p.m.
man; and Stanley Sloan, national UJA vice chairman. warmth and human understanding are of utmost importance. We have more Jewish funeral directors to serve you. we're the choice in Florida. Norman Cutler, Cantor Manny Mandel (Relhrious Advisor), Marvin Reznik. Florida's Most Trusted, Respected Family Funeral Homes. period from June 1 to Nov. 30.
months of 1982." the report said. the USSR reached its zenith." Jan. 3. 1983. at the Playdium. 12 and his trial began Dec. .
bievskv case to: Gears* Shukz. Secretary of State. 2201 C St..
service again, as he had feared. He has also found work. after he was refused taw! Ncw^lbu Can Dial a VMinute Overseas Call.